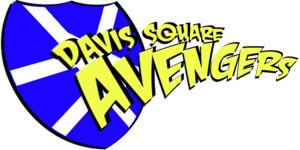 A basic overview of the Davis Square Avengers: our mission, our membership and more. Our previous (and sometimes current) adventures. Local gaming resources, members' projects, and more. Disclaimer: This site is a fan work using a number of images and concepts relating to the intellectual properties of a number of companies including 20th Century Fox, Universal Pictures, Dark Horse Comics, Eden Studios, Margaret Weis Productions, White Wolf Publishing, Wizards of the Coast, Green Ronin Publishing, and others. These images and concepts are used without permission and should not be held to imply any form of relationship with the rightful copyright holders or claims over the relevant intellectual properties. No copyright infringement is intended. Correspondence regarding the use of these images and concepts should be directed to the webmaster.